Those of us who work for Gettysburg Bus Tours feel fortunate every day for our role in commemorating the Battle of Gettysburg and American Civil War. Thanks to the Gettysburg National Military Park and National Park Service, we regularly visit over a thousand different well-maintained Confederate and Union monuments and markers, historical buildings, cannons, and more, some in an environment that closely resembles this moment in history. Due to the sheer volume of things to see in Gettysburg, we recommend spending several days if you want to be able to see and do it all. We know this isn’t always possible with everyone’s tight schedule, so here’s a short list of monuments our guests describe as can’t-miss highlights. Eternal Light Peace Memorial – Located on Oak Hill, the Eternal Light Peace Memorial features the Flame of Eternal Peace and was created in 1938 to commemorate the 1913 Gettysburg reunion and 50th anniversary of the Battle of Gettysburg. Pennsylvania State Memorial – If you believe “bigger is better,” you’ll want to see this one. The Pennsylvania State Memorial at Cemetery Ridge is the largest monument on the battlefield, standing 110 feet tall. “Return Visit” Lincoln Statue – One of the most common photos we see on our Twitter feed is guests standing next to the Lincoln Statue outside the David Wills House. One of the newer statues to join the collection in Gettysburg, this was commissioned by the Lincoln Fellowship of Pennsylvania, sculpted by John Seward Johnson II, and dedicated in 1991. 12th and 44th New York Infantry Monument – Known to many as the “castle” on Little Round Top, this is again a very popular photo location. The largest and most expensive regimental monument on the battlefield was raised as a memorial to Ephraim Elmer Ellsworth, the first Union officer killed during the war. 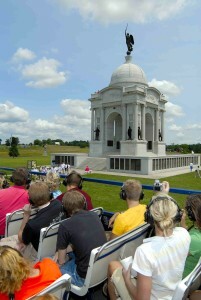 Soldiers’ National Monument – In the middle of the Gettysburg National Cemetery stands the Soldiers’ National Monument. Honoring all soldiers at Gettysburg, this monument was dedicated in 1869 without the “Plenty” or “Peace” statues, which were added a short time later. In addition to “Plenty” and “Peace,” “War” and “History” sit on each corner of the monument’s base. Narrowing our list down to just five guest favorites was extremely difficult. Did we hit the five you would’ve picked? What are some of your favorites? Let us know on our Facebook page, and be sure to see as many as you can on your next trip to Gettysburg! Posted in Blog, Interesting History, Monuments, The Civil War, Things To Do and See and tagged American Civil War, Battle of Gettysburg, eternal light peace memorial, Gettysburg Monuments, new york infantry monument, pennsylvania state memorial, return visit lincoln statue, Soldiers' National Monument on June 16, 2017 by Gettysburg Battlefield Tours.